Picture: ICV Chief Executive Steph Harvey, Senator Nova Peris, and ICV Ambassador Dion Devow celebrate the report launch. An independent review by the auditing firm KPMG has backed the approach taken by Indigenous Community Volunteers (ICV) to tackle disadvantage in Indigenous communities. ICV is a national non-profit development organisation working at the invitation of Aboriginal and Torres Strait Islander communities. Community development projects are developed and controlled by each Indigenous community. In preparing the report* KPMG assessed ICV’s activities in two communities in which it has worked for some years. In Ali Curung north of Alice Springs the projects aimed to improve the health of both humans and dogs through a multi-disciplinary education program. After changes to the management of the dogs, children in Ali Curung became noticeably less sick and more likely to go to school. In Pinjarra south of Perth in the electorate of Canning, the Murray Districts Aboriginal Association (MDAA) invited ICV volunteers to renovate a cultural centre. The project became the catalyst for other projects including a community garden and cooking classes that improved nutrition. ICV chief executive, Stephanie Harvey, welcomed the KPMG report. “It’s a wonderful endorsement from a reputable research-based company. “We began in Pinjarra to renovate a building, but because of the strength of our partnership developed over many years, we ended up strengthening the community’s leadership also. “That’s where the power of our work lies; in listening and building consensus about what the community wants to do. When a community has its own vision, with resources and support, it’s more likely to own the process and realise that vision,” Ms Harvey said. The findings present an opportunity to reboot the importance of grassroots community development to ‘close the gap’. “There are no quick fixes in Indigenous communities,” said Ms Harvey. “If governments are real about reducing disadvantage they must fund this kind of long haul development work. It results in sustainable and measurable change and creates opportunities for genuine reconciliation in action. “Otherwise it’s business as usual and precious resources thrown at unwelcome projects that don’t achieve much in the long term,” she said. 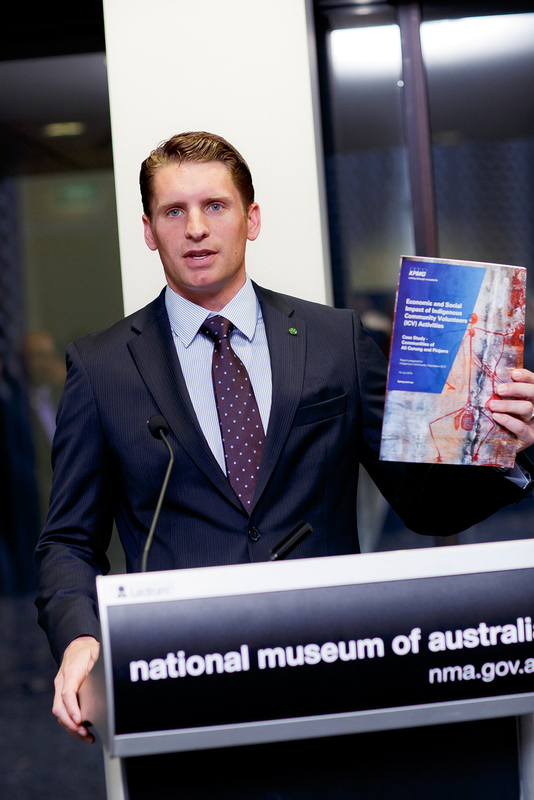 The report was launched at the National Museum of Australia in Canberra on Monday 19 October. The ABC news and Koori Mail stories are here. *The report, titled Economic and Social Impact of Indigenous Community Volunteers Activities, is based on consultations with staff and stakeholders as well as multiple data sources.